Well, it's going to be official, folks!!! 2010 marks 10 years of Brad and I being together, so we've decided to celebrate by getting married next year. We want to share this awesome news with our Atomic Zombie family here and abroad. We haven't decided on a date yet, but will keep you posted. Tonight we will tell our family here and do some celebrating!! So, the winter is setting in, time to set our sights on our electronics projects for awhile. The garage is officially closed now to bike building. We recently launched a new Do-It-Yourself instant download plan for all of you electronics hobbyists. We know you're out there! This is the first of many electronics plans that we will be releasing over the next year. This easy-to-build Night Vision Viewer lets you see deep into the night without detection. This covert system can light up a room as if you were using a flashlight, yet only you will be able to see the light. The performance of this Night Vision Viewer is as good as some commercially available night vision systems that cost a lot more. Using invisible infrared light, the Night Vision Viewer can see in 100% darkness, indoors and outdoors, and will run from a battery pack for several hours. The covert Night Vision Viewer can also be used to detect other night vision systems or as a jammer to hide your face to most security cameras. Another interesting effect of the Night Vision system is referred to as "X-Ray Vision", which allows the user to see through certain materials (including clothing) that may be opaque to infrared light. If covert surveillance or countermeasures is your game, then this is one piece of equipment you will definitely want in your spy gear arsenal. For more information and how to order this project, visit http://www.atomiczombie.com. Using invisible infrared light, the Night Vision Viewer can see in 100% darkness, indoors and outdoors, and will run from a battery pack for several hours. If covert surveillance or countermeasures is your game, then this is one piece of equipment you will definitely want in your spy gear arsenal. The Night Vision Viewer is built around commonly available parts, most of which can be found new at any electronics store, or be taken from dead video appliances. This project is well within the reach of anyone with a desire to do a little hardware hacking, and even includes a basic guide to getting started in electronics. There is a lot of room to add your own modifications as well, so you can create your own unique spy gear in order to further your cause. The truth is out there, and now you will be able to see it, even in total darkness! 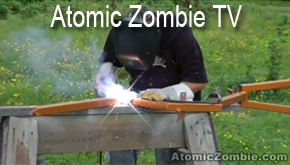 More details and ordering information at http://www.atomiczombie.com . I have watched this video by Veterans Affairs Canada so many times this past week. It really is well done. Glad to see this ad popping up on many web sites to honour those who have served, and still serve. "This November, make remembrance more than something you feel." NEW - mousepads for all you bike building freaks! Just added - mouse pads in a variety of styles. Specially designed for bike and garage freaks. Choppers, trikes, recumbents and tall bikes. Makes a great Christmas gift for that hard-to-buy person in your life. We welcome your design suggestions, too. First of all, I want to thank Brad and Kat for such an incredible site, ditto to all the builders who also share their building tips and different web sites to buy the this and thats. Everyone here is very friendly and open when it comes to sharing knowledge. For me, it is more than just an informational site. When I was 9 months old, I had contracted the polio virus, from the waist down was nearly all affected, all of my left leg and about 90% of my right. Most of my youth was spent in and out of hospitals, eventually, as I got older, I became strong enough to get around mostly unaided and live a pretty normal life. One of the positive side effects was all the use of crutches, using my arms to get around, had made my upper body very strong. I competed in arm wrestling tournaments for many years, winning several world and national titles. After that, I discovered handcycling, I've done a few RAGBRAI's and several centuries and truly enjoy riding. Through handcycling, I discovered sledhockey and have a paralympic gold medal from the 2002 Paralympics in Salt Lake City. About 4 years ago, things changed pretty dramatically. Over the years, I had used my arms quite a bit on a daily basis, and all the overuse had taken its toll. Fatigue and pain was becoming more and more prevalent, I had worked for many years and it was affecting my job. I was now dealing with Post Polio Syndrome and it was one of the toughest decisions I had ever made, so I had to quit my job. I had worked for the same company for 25 years. The transition was not easy. I am a doer, not a sitter, but for the sake of preservation, a lifestyle change was needed. Up until about 4 months ago, I just kind of moped around, not sure what I was gonna do. I was 47 when I left my job, too young to sit around. Then, I found this site, quite an awakening. All of a sudden, I was energized, saved my pennies, bought an angle grinder, a small welder and other tools when I could afford them. I had mentioned in another post that my neighbor and I are building 4 Warrior trikes, one of those is for my son-in-law who is an Iraqi vet in the infantry. He came home with a partial spinal cord injury, he has limited use of his legs, but still strong enough to ride, and hopefully gain some strength back. With Brad's plans, this trike is gonna give my son-in-law some freedom back. He will now be able to ride with his sons. For me, I absolutely enjoy wheeling out to the garage, taking a piece of square tubing and creating something with it, figuring out angles, steering, chain lines, etc. It feels good to use my brain and my hands again to do something productive. It is more than just trikes and bikes to me - it's an opportunity to build something at my own pace, to learn new things, maybe even start a trike rental business, but mostly, it has given me a new beginning. We get some pretty cool emails from folks all over the world. Recently, Fredrik, who lives near Helsinki, Finland, sent us a message about his bike projects and why he loves being an Atomic Zombie. "Hi to all my Atomic Zombie friends around the world. My name is Fredrik and I live in Finland. I am 28 years old. I build bikes all my life. Some choppers, some recumbents and some tandems. I ride a bike every day to work. I use my bikes all the time because it's too expensive here to drive cars. 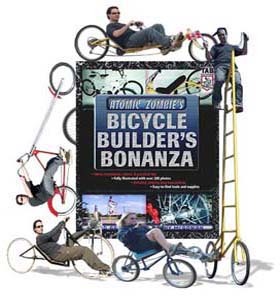 I found your site over three years ago when I saw a picture of Brad on that tall bike from years ago (the World Record SkyCycle). I am on the forum many times almost every day learning more about the bikes you build and what other people are making. It is very inspiring to someone like me who doesn't have much money, but likes to make stuff himself. 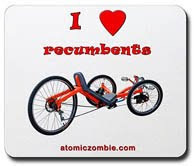 My favorites are the choppers and trikes that Atomic Zombie makes. I like the Overkill chopper, and Warrior and Deltawolf bikes the best. Mine aren't that good yet, but I am learning more thanks to you and the great people on the forum. I just wanted to say thanks for all the things you do for guys like me who like bikes. My next bike will be like the Warrior trike, so I will send you some pictures when it's done. I like how you make the plans and all the pictures, so anyone like me can build them. I love being an Atomic Zombie! You are the best."